I love Sailor's ProGear line. I've always been a fan of flattops, preferring the slightly modern look over the more traditional cigar shape. Sure, that's a preference, but it's my style. That said, I'm new to sailor. I picked up the Kanreki randomly, around my birthday, at a whim. Someone had given me an Amazon gift card and, knowing that I wanted to add a Sailor to my collection, dove in. The Kanreki was designed to celebrate the 60th birthday of one of Sailor's nib designers, Kagwaguchi Akihiro. The second I put ink in this sucker, I was hooked, spawning a love affair that will undoubtedly do some serious damage to my wallet. Since this pen's arrival, I've added a ProGear Shiki-Oriori in Metallic Green and a ProGear Slim Purple Cosmos to my collection, with a ProGear Cocktail Series Après Ski on the way. So enough about what Sailor has done to my collection; let's talk about the pen and, specifically, it's nib. Man, what a beautiful nib this pen has. This particular example is a 21k gold H-EF. I generally prefer softer nibs for my day-to-day writing; the MB 1912 and the CONID Regular are two of my favorite writers for the bounce you get. I was shocked when I put this nib to paper for the first time how much I enjoyed it. Offering a bit of feedback - a reserved amount for a Japanese EF nib - with a decent amount of ink flow, I was shocked. And hooked. Yeah.. hooked. Then I paused and looked at the nib. I mean, really stared at it. It's gorgeous. 21k gold, stamped perfectly, literally glistening as it slides across the page. It's really unlike anything else I own. The feel of writing is unique when compared to any other stiff nibs I own, with more character than anything steel in my armada but more precise for everyday writing than many of my gold nibs. So what did I do? I brought it to work and put it through its paces. Loaded with Sailor Jentle Granade, I went to work on some of William Hannah's 115gsm paper, it held up like a champ. Switching over to the Nanami Paper Seven Seas Crossfield, the 52gsm paper made the pen shine. While you can feel the tiniest bit of feedback, it really sung across the page with a controlled glide. I couldn't tell you why, but the H-EF nib combined with the smoothness of the paper creates a "stickiness," allowing you to stop when you want to stop and keep an excellent level of control. Now let's get into the pen itself. Capped, it's surprisingly short, but take off the cap and you realize how deep inside the pen sits. The pen itself is built with polished gold hardware with a band near the finial, on the section, below the end cap on the clip, and two at the base of the cap with one thicker than the other. 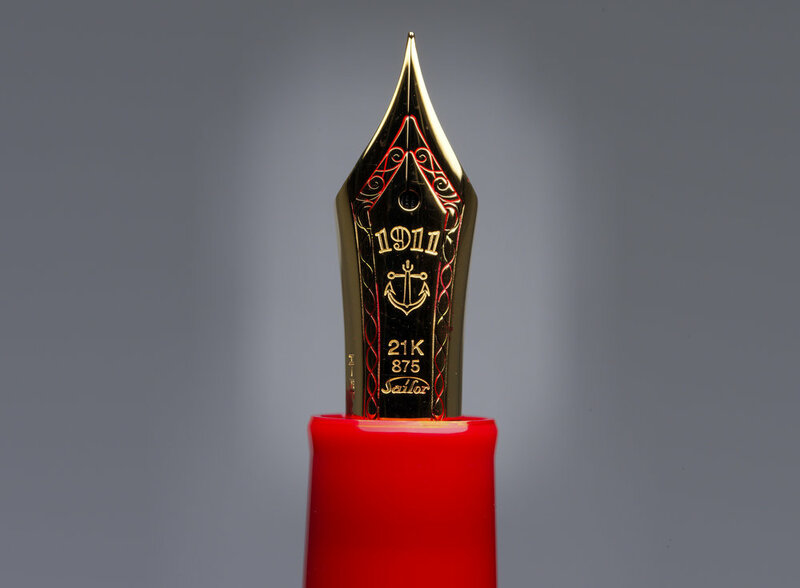 The thicker band says "SAILOR FOUNDED 1911 - KAN." The pen's most standout feature is the pen's three-tone red body, with a bright red for the body, a muted red for the cap, and matching burgundy for the finial and end cap. It's a surprisingly gorgeous pen that I'm surprised didn't garner more press when it was released. The nib is standard for the majority of Sailor ProGear pens - ProGear Slim carries at 14k nib. I strongly recommend everyone go check one out; they're really something special.